The starting grid for the Austrian Grand Prix meant we anticipated some interesting racing action, but nothing could have prepared us for what we were presented with - overtaking galore, drivers retiring, final lap drama, tyre strategy stress, a safety car, and no major kerb related incidents. There were spots of rain throughout the race but no one had to switch to wet or intermediate tyres, meaning it was all about pitting at the right time and getting the most out of the compounds as you can. If you missed any of the action or want to relive lap by lap - particularly that last lap! - then the Factbyte Factbox replay is here for you. Hello friends, welcome to the Factbyte Factbox for the Austrian Grand Prix - we've got crazy kerbs to deal with, changeable conditions, and grid penalties galore, it's all happening at the Red Bull Ring. Are you with me? We're half an hour away from the start of the race, so the pit lane has opened to allow drivers to practice starts and make their way to the grid. The ultrasoft is back in action this weekend, and we had a wider variety of tyre selections throughout the field, so strategy could be interesting today. Lewis Hamilton secured pole position, and with both Nico Rosberg and Sebastian Vettel taking five place grid drop penalties, we've got Nico Hülkenberg on the front row! The kerbs have been causing consternation throughout the weekend, with several drivers hitting them too hard, damaging their suspensions and ending up in the barriers. Daniil Kvyat, Max Verstappen, Sergio Pérez and Nico Rosberg have all fallen foul of the higher kerbing so far. Kvyat, in fact, has to start from the pit lane today after damaging his car during qualifying in the kerb-related incident. Tweet from @WilliamsRacing: We found structural damage on @MassaFelipe19’s new spec front wing & are not prepared to race it on safety grounds so, @MassaFelipe19 will start the #AustrianGP from the pit lane with the previous spec front wing. It's dry at the moment, and the drivers are all on the slick tyres, but it's overcast conditions and there could be rain moving in. The mountainous surroundings make weather forecasting very difficult. Jenson Button, on the grid: "Normally I’m looking at the second set of starting lights. Nice to be up here." Tweet from @HaasF1Team: 5 minutes to go and the weather latest is, no more rain expected. Pascal Wehrlein starts from 12th on the grid today, which is an impressive position for the Manor drivers, he says: "Will try my best today. It’s a new story, race distance, it’s important to keep the tyres as long as possible and also the brakes, because last race we had a brake failure. I will try my best and hopefully we will get the best result we can." Hülkenberg has never managed to finish on the podium in his F1 career so far. From the front row of the grid, he's got a good chance to take that next step. There's a good mix of tyre choices on display for the start of the race. The top three are all on ultrasofts. Kimi and Daniel have chosen the supersofts. Much of the midfield are also starting on the red stripes, whilst Haryanto and Nasr (down in 20th and 21st) are on the yellow softs. Felipe Massa has taken up the front spot at the pit lane exit, his mechanics making final preparations. The formation lap gets underway, with Hamilton leading the field around the 4.3km track. It IS odd seeing a McLaren all the way up there. Chaos just before the lights went out, as Pascal Wehrlein went forward into Massa's empty grid slot and then reversed his way back out again. That's surely worth a penalty! Clean first corner, but Hülkenberg has lost places off the start. Button's up to second! Hamilton has already roared off into the distance, as you might expect. Räikkönen is hustling up behind the McLaren looking to get past and stop being held up. Rosberg has overtaken Max Verstappen, and sneaks past Daniel Ricciardo as well - he lost a position off the start line, but is back up to fifth now. Lots of locking up as the second lap gets underway, tyre temperatures still not up to scratch yet. Kvyat has stopped out on track, he's off in the run-off area down at turn one. Tweet from @ForceIndiaF1: Checo started behind SAI, and now the two are proceeding together up the field. DRS now enabled, so we may be in for a treat! Räikkönen is being held up by Button at this point, but the pair are on different tyres so the Finn may not be as desperate to get past as he might be. Hamilton has a solid three second gap already. Rosberg takes to the inside of Nico Hülkenberg and easily makes the pass before turn two, moving into fourth. Hülkenberg, presumably distracted, also loses a position to Verstappen as well. The Ferraris make their moves, Vettel moves up to sixth and Räikkönen finally storms past Button to get up to second place. Hamilton nearly four seconds ahead now. Hülkenberg is still losing positions, he started second and in just eight laps he's down to eighth. Hamilton puts in the fastest lap of the race so far - 1:11.250. Rosberg goes on the attack against Button and easily powers past him. Button is left out of position and comes under threat from Verstappen as well. Verstappen has a go at turn one, but can't quite make it. He backs off but gets the better run down to turn two and finally gets past. Hülkenberg has come into the pits for a set of supersofts, he's all the way down in 17th place now! Early pit stops for Button and Bottas, both moving onto the soft compound - the hardest of the three. Nico Rosberg dives into the pit lane as well, it's yellow softs going on that Mercedes as well. Hamilton's tyres may be starting to wear out, but he's likely keeping an eye on how Rosberg performs before deciding what his next move should be. Thanks to the pit stops, Wehrlein is up in sixth place. Gutiérrez makes a fantastic move on Felipe Massa, and the Williams driver quickly comes under pressure from Felipe Nasr as well. Rosberg easily sweeps past Massa, but the Brazilian dives into the pit lane for another super-speedy Williams stop. Pascal Wehrlein has reported some light rain. Wehrlein pits for Manor, he's got dry tyres on still so the rain can't be that bad. Sainz and Pérez go wheel to wheel with the Force India driver just having the edge to remain ahead - they're battling for 15th and 16th place. Verstappen dives into the pit lane and moves on to the soft tyres. More rain reports from Pascal Wehrlein, but so far he's the only one to be seeing it! Rosberg is still making his way through the field, he easily dispatches Romain Grosjean, who has yet to pit. Verstappen also overtakes the Haas. 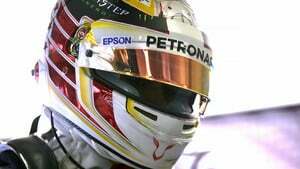 Ted News: Hamilton said yesterday he would adapt his driving style to make the ultrasoft tyres work as long as possible. He's certainly doing that at the moment, they're twenty laps old and looking the worse for wear, but he's still going. Hamilton, Räikkönen and Vettel are the top three with none of them having stopped. They've got a fifteen second gap ahead of Nico Rosberg in fourth. Tweet from @toomuchracing from the track: "Supposed to be a good Williams track, Massa can't pass the Renaults..."
Bottas locks up into turn two but battles his way past Gutiérrez for 11th place. Rosberg sets the fastest lap of the race so far - 1:09.666. Lewis Hamilton comes into the pit lane for his stop then, 24 laps those ultrasofts lasted, an amazing job by the defending champion. Soft tyres go on that Mercedes, it was a relatively slow stop. Räikkönen pits and it's a much better stop for the Ferrari crew. He's out in sixth place. Meanwhile, Nico Rosberg is banging in the fastest laps, he's taken three in a row so far. Replays show Pascal Wehrlein complaining over the radio that Kevin Magnussen is changing direction multiple times as he tries to defend. Not so good driving from the Renault driver. Sebastian Vettel leads the race now, having not yet stopped. Incident involving Kevin Magnussen and Pascal Wehrlein under investigation - more than one change of direction. Hülkenberg is back in the pit lane again, that's his second stop of the day and it's soft tyres going on the Force India. Yellow flags as Sebastian Vettel spins across the track, huge damage, and comes to a halt on the kerbs. Team radio to Sebastian Vettel: "As you can see, rear right exploded." Seems like they left him out too long on that one set of tyres then, he was leading the race having not yet pitted, and now he won't get the chance. All cars to follow the safety car through the pit lane. The Ferrari is being towed away now, and the marshals are clearing up any remaining debris. Replays of the incident show Rosberg right behind Vettel as the tyre exploded. The German driver got showered in debris, and he's been on the radio asking to be checked for overheating in case debris got lodged in places. Super slow motion replays show there are threads of Vettel's tyre hanging off Rosberg's tea tray, flapping about in the wind. Incidents involving Romain Grosjean and Nico Hülkenberg under investigation - speeding in the pitlane. 5 second time penalty for Kevin Magnussen - more than one change of direction. Nico Rosberg gets a good restart in the lead, with Lewis Hamilton close behind him. The two Red Bull drivers are next with Verstappen ahead. More locking up on the restart showing just how crucial the tyre temperatures are on this resurfaced track. Rosberg is already pulling out a good lead. He and Hamilton are on the same tyres now, although Lewis has a set that are about ten laps fresher. Vettel has made his way back to the pit lane and taken up a position on the pit wall. It's his birthday today and everything. Rosberg is back on it, hitting fastest lap after fastest lap once more. 1:09.449. 5 second time penalty for Romain Grosjean and Nico Hülkenberg - speeding in the pit lane. McLaren's pit wall bods are starting to see a few drops of rain in the pit lane. The Mercedes pair are pulling out a solid gap to the rest already. Just over halfway through the race and there's been plenty of action already. With more and more reports of spitty-spots of rain, there could be more to come! Button tries to go round the outside of the Sauber, but he can't make it. He tries another outside attempt at the next corner but has to back off once again. Team radio to Daniel Ricciardo: "Light drops of rain in turn two." Massa managed to sneak past Sergio Pérez but the Force India driver isn't giving up easily, and he's sticking with the Williams to look for a way back past. Tweet from @ManorRacing: Lap 40/71 | Good pace from both our drivers. They're a second apart on different strategies. Unseen by us, Button did manage to get past Nasr to move up into seventh place. Romain Grosjean brakes later than Nasr and makes it past the Sauber driver. Nasr losing several positions at this portion of the race. Sebastian Vettel on whether he was left out too long on the tyres: "I think it was fine, other people went as long or longer. I didn’t go off anywhere, we don’t know." Two more places for Nasr have been taken from him - Massa and Pérez have gotten past the Sauber, whilst still keeping on with their own battle. Replays show Nico Rosberg getting it wrong at the exit of turn one, he runs very wide but keeps it clean and continues in the lead. Team radio to Lewis Hamilton: "The suspension loads at turn nine are critical." Replays of Nico Rosberg's car show there's still a lot of tyre debris flapping about on the car. Also to his left, the bargeboard has snapped and is dangling off the car. Hülkenberg pits in a cloud of brake dust, after reporting on the radio of severe vibration. Hopefully a new set of tyres will ease his pain. Hamilton informed over the radio to close the gap to Rosberg. Hamilton comes into the pit lane for a quick stop. The Mercedes driver rejoins in third place, but struggles on the fresh tyres and runs a bit wide. Ricciardo is behind him but not close enough to capitalise. Rosberg comes in to the pit lane from the lead of the race. New tyres go on the car but they don't touch any of the debris or the wobbly bargeboard. Rosberg rejoins in the effective lead, ahead of Hamilton, although Verstappen is technically ahead on track. So we will see a real battle between the two Mercedes drivers, on track. Nico has the supersoft tyres on, Hamilton the softs. Lewis questions why his teammate has a different compound and is told they think the softs are the one to be on. Team radio from Hamilton: "Why is he on a softer tyre than me?" "Lewis, we think this is the right tyre to get to the end." Räikkönen closes up behind Ricciardo and benefits from a mistake by the Australian to easily move past for fourth place. Ricciardo, though, has a huge gap to Jenson Button who is a good twenty seconds down the road. Not great from starting third, but very good considering he's in a Honda. Nico Rosberg hunts down race leader Verstappen, he pulls alongside, goes around the outside and can't do it at the first time of asking, but moves ahead after a second attempt. Hamilton moves up behind Verstappen to attempt the same move. Lewis doesn't get the move down the main straight which was his best opportunity. Now Verstappen hits traffic, which won't help his defensive skills. Hamilton jinks alongside Verstappen, who was distracted by Jolyon Palmer, and the Mercedes powers his way through. Felipe Massa is having a very difficult afternoon, and he comes into the pit lane for the third time. Massa is pushed back into the garage, his race is over. Ricciardo easily makes it past Button to move into fifth. Button's told to stop hustling and just bring the car home for some valuable points. Nico Hülkenberg and Fernando Alonso have both gone into the pit lane and retired. Lewis Hamilton sets the fastest lap of the race so far - 1:08.411. There's half a second between him and race leader Rosberg now. Meanwhile, Kimi Räikkönen is gaining on Max Verstappen, desperately hunting for the final podium position. The gap for the lead is tiny, and Rosberg has come across some traffic ahead of him. Hamilton has a look, running slightly wide to see if there's an opportunity, but there's nothing doing yet. Rosberg's supersoft tyres are starting to look worn, Hamilton's softs are holding up well. There's just two laps to go though. Bottas moves to the side very respectfully, allowing both Mercedes through. Hamilton runs a fraction wide to lose a tenth or two, but he easily makes it back again down the home straight. Hamilton pulls alongside but Rosberg pushes him off track. Hamilton pulls back on track, and then there's damage to the front of Rosberg's car, the front wing dragging and throwing up sparks. Lewis Hamilton wins the Austrian Grand Prix! Hamilton gets the position, Rosberg limps home with a damaged front wing - the pair had a collision as Lewis tried to rejoin the racetrack. Rosberg ends up fourth, Verstappen and Räikkönen gain the podium positions. Team radio from Hamilton: "I was on the outside, it wasn't me that crashed." At the same time, something failed on Sergio Pérez's car and the Force India went straight on across the gravel trap and ended up in the barriers. Hamilton pulls into the first place parking space and thumps his car in happiness. Manor are celebrating as Pascal Werhelin finishes tenth and picks up a well deserved point for the team. Verstappen asks what happened on the last lap and Hamilton describes the incident to the younger driver. Then he leans both hands against the table, taking a moment for himself. Tweet from @ForceIndiaF1: Unlucky race for us - a good haul of points slipped just at the very end. We'll regroup and get back stronger in our home race! There's a smattering of booing as the drivers take to the podium - perhaps some German fans disappointed that their driver missed out on the win. Incident involving Nico Rosberg under investigation - causing a collision and failing to stop with a seriously damaged car. Much more booing as Hamilton raises the trophy over his head. Verstappen smiles broadly as he receives his trophy - if only he wasn't wearing lederhosen themed overalls, it would be the perfect moment. Podium quotes - Lewis Hamilton: "What an incredible race that was. It was incredibly tough, this track is amazing. Big thank you to all the fans for coming out. [More booing]... That’s not my problem, that’s their problem." Podium quotes - Max Verstappen: "It’s an amazing day. To finish second in a Red Bull car at the Red Bull Ring is incredible. I enjoyed it a lot, it was an exciting race. Thanks to the guys, they gave me a great car." Podium quotes - Kimi Räikkönen: "Not an easy day for us, I thought we didn’t really get what we could have. We had good speed in the end, maybe a chance to overtake Max, but there was a yellow flag and he finished in front of me. That’s how it goes sometimes. The car’s been feeling good all weekend… obviously for the team, Seb had an issue. Not an easy weekend. For the speed we had, I don’t think we got what we deserve, but that’s racing." Niki Lauda suggests Nico had a brake problem earlier in the last lap which allowed them to close up so much, and that the collision is likely Nico's fault, but "we have to look again." Toto says the incident was "brainless." More from Toto Wolff: "We were marginal on brakes, we couldn't tell the drivers. Nico had a brake-by-wire failure onto the last straight, defended very hard. Then seeing both cars colliding is very upsetting. At the moment, I don't know what I will say... it could just as easily have been a double DNF." Räikkönen and Verstappen were just three tenths of a second apart as they crossed the line - amazing finish from the pair of them. We were expecting a decent race with the slightly mixed up grid, and we weren't let down! There were a few laps in the middle where it was quiet, but the start and the end more than made up for it. Great selection of drivers picking up much-needed points today, Button, Grosjean and of course Wehrlein. Force India had a torrid afternoon, from second on the grid to two DNFs. Ferrari also suffered at the hands of bad luck, and despite a podium, Kimi didn't seem too pleased with their performance. And the thing that will tide us over until next week's race of course, yet ANOTHER fallout at Mercedes. At what point is Toto Wolff going to actually explode with rage? The repercussions will be fascinating to watch unfold, particularly as Rosberg has a steward's investigation to deal with as well. I can't wait for next week, now! Bring on the British Grand Prix!